If you’ve always wanted that sprawling beachfront wedding, or that elegant outdoor soiree in a lush garden setting, your wishes are one step closer to being realised! 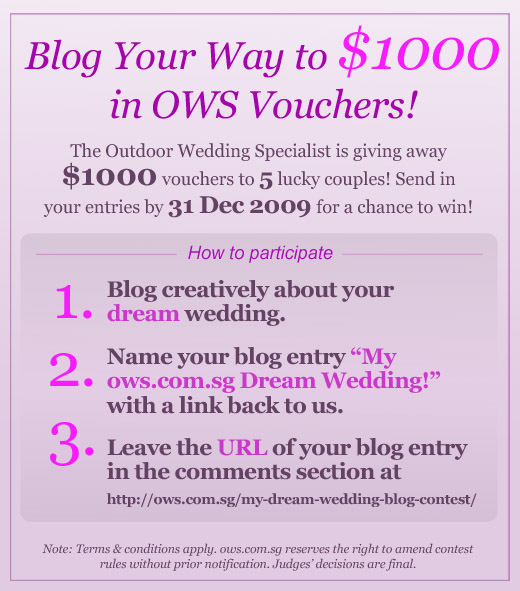 The Outdoor Wedding Specialist is giving away $1000 vouchers to FIVE lucky couples. 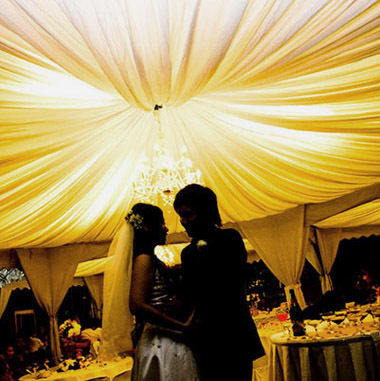 If you are planning to have your wedding in 2010, this is a contest you CAN’T afford to miss! 1. Blog about your dream wedding. Add in photos or sketches, be creative! 3. Leave the URL of your individual blog entry in the comments section below, so we can find your blog entry. It’s as simple as 1-2-3. So what are you waiting for? Participate to win one of FIVE incredible $1000 vouchers! Save the steps in the picture below and send it to friends and family! *Tune in for the results in January 2010. Hiyo, here’s the link to our dream wedding!